Many of the fields on this form are required. Please make sure you fill out all the fields before you hit the submit button. Have you ever been on a Collette FAM? Are you a member of our President's Club? How many passengers has your agency booked this year on escorted tours? 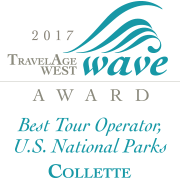 Have you promoted a Collette Tour recently? Who do you currently promote as your top 3 escorted tour companies? How large is your customer mailing list? How often do you mail to your customer mailing list? How large is your email list? How often do you email your online email list? Do you travel on all of your group departures?